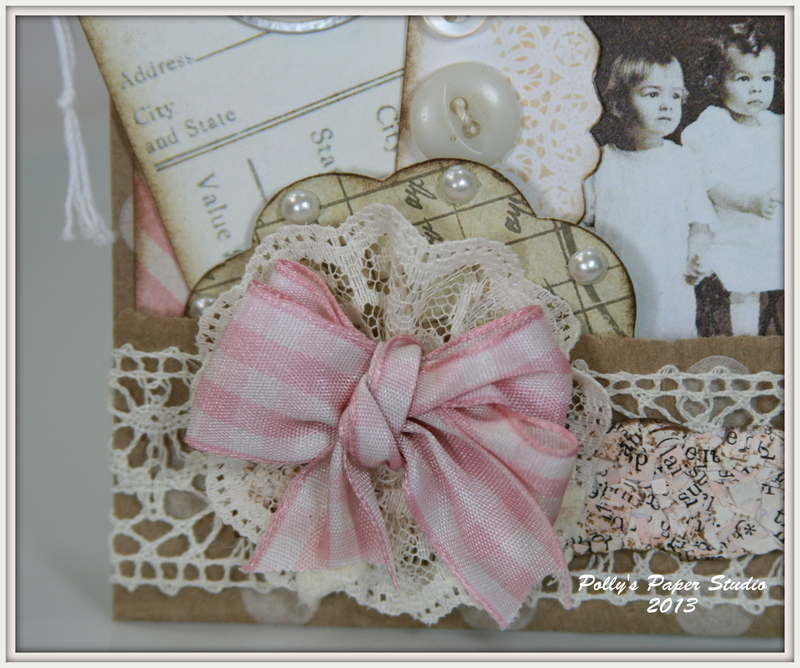 I’ve created a very special little pocket full of tags with shabby chic patterned papers and vintage images for the new challenge Let’s Get Shabby. The theme this month is confetti. I had a difficult time finding confetti to purchase that would match a shabby chic theme…so I created my own by inking a vintage book page and chopping it up with multi blade scissors. You should hop on over and check out the challenge…the prize is awesome and the projects made by the other DT members are just beautiful. So I find myself with my projects finished….and the tables all cleaned up….but not enough time to start working on something new. I’m having dinner in the shop tonight ( my new favorite Malibu burger from Morningstar Nom Nom Nom)….since there’s not enough time to get home before soccer. I just happen upon my Pinterest boards ( big surprise) to check out what’s going on with my crafty peeps. I would be watching Cupcake Wars on foodtv.com but my laptop overheats and shuts off when I try to watch video : ( Anyhoo….by chance I find this blog called ReFashionista. The idea behind her blog is she finds thrift store clothing items….and restyles them into something more fashionable. This intrigues me….as I love to re purpose things too. I admit…I did scroll all the way through many many pages of posts (guess I had more time than I thought .) A lot of the clothes turned out pretty cute…even if they are not so much my style….and since I’m a Mom of 2 teenage boys, a business owner, a country girl that drives a pick up truck, and a constant home remodeler….I’m not sure I’ll be turning a pillowcase into a dress and strapping on some 4 inch heels. But she seems to be a pretty young woman…and I can image she has lot’s of places to wear fashionable clothing to. Not to say that those of us who live out in the country can’t get our looks on too !!! The posts are pretty funny too….and she has many travel pictures. And the cutest little weiner dog named Douglass. If you like to sew….you should check it out….maybe you’ll be a fashionista too ! It’s about time to leave for soccer now….hope it’s not too cold. Yesterday we had blizzardy conditions for most of the afternoon. Gotta love springtime in Michigan. 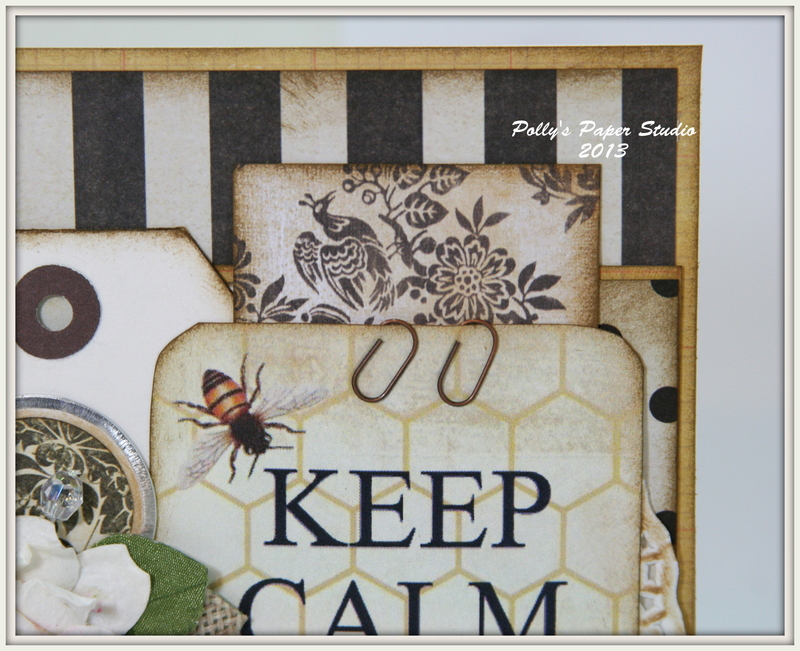 Here’s another Bee card…..I’m all a buzz about this one. Okay….there’s just soooo many bee jokes right???? I have to use them!!! I haven’t really got caught up in the ” KEEP CALM and” trend….but when I saw this sweet image….I couldn’t resist. 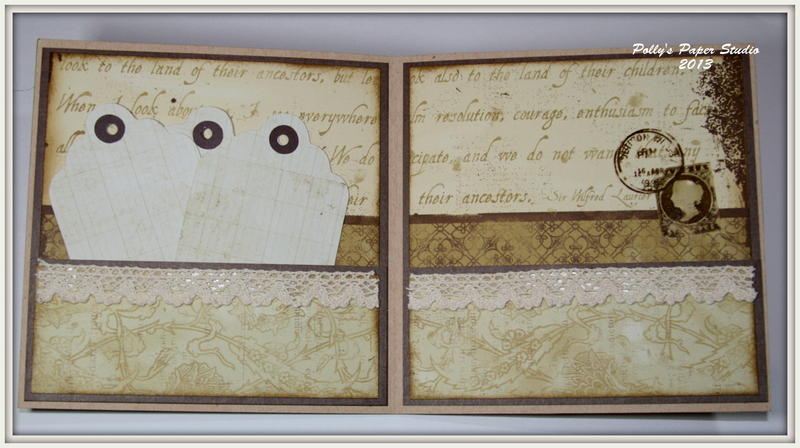 All the patterned paper layers came from the scrap and salvage box. Who’s a frugal crafter????? THIS GIRL! 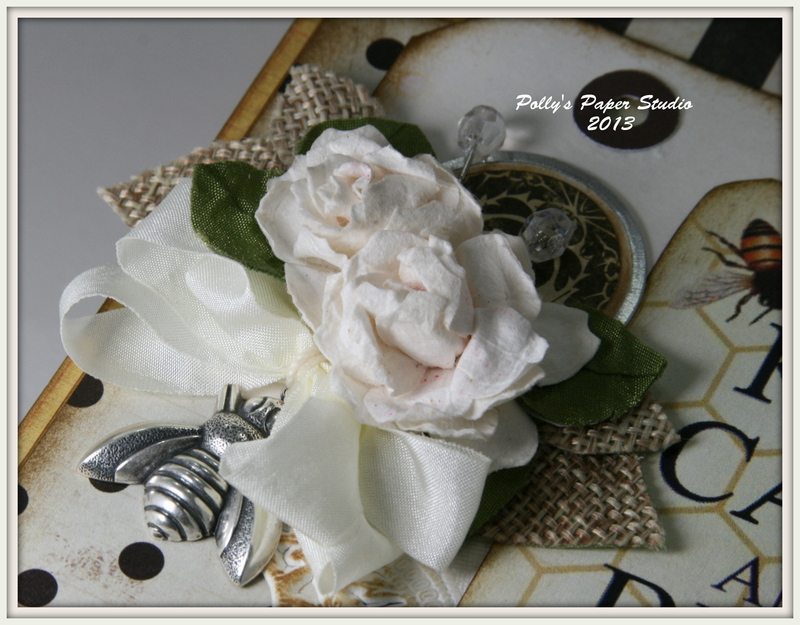 There’s an oh so sweet little bee charm hanging from the Ivory Wrinkle Ribbon bow . 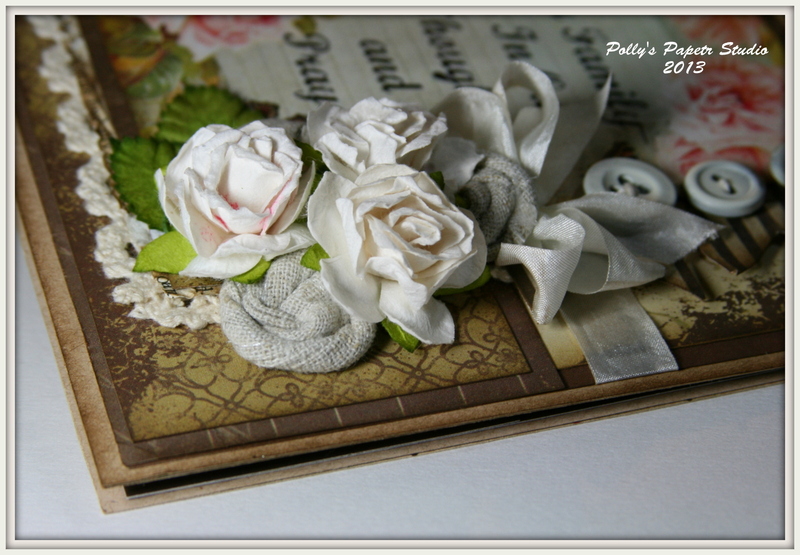 I’ve also added burlap leaves and a large creamy pale rose. The trims are from Really Reasonable Ribbon. There’s a fair amount of patterns here…..so I used a well ink yellow to separate and stay in the bee theme. I love those two tiny clips at the top of the tag. Here’s a close up of the flowers : ) I just love how it turned out!!! 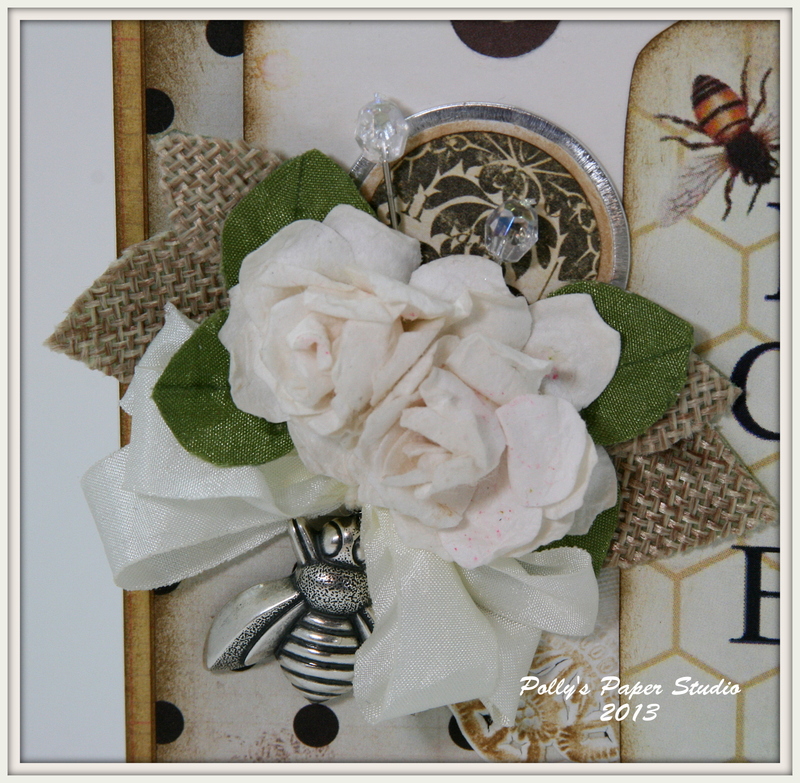 Here’s just a quick post to share a sweet shabby chic Bee card. I’m just loving the soft colors on this card. There is a fair bit of layering here with pretty patterned papers. There’s a generous strip of Shell Gray Diamond Satin and a pretty little poofy bow of Ivory Wrinkle Ribbon from Really Reasonable Ribbon. I’ve also added a painted and inked chipboard frame with tiny lock plate and real vintage buttons. Large paper flower is accented with burlap and ribbon leaves. I think this would make a lovely Mother’s Day card : ) I’ve added it to the Etsy shop…as well as a few other Mother’s Day or all occasion cards. Want to hop on over and check em out? Just click here. You all know by now that the summer holidays are some of my favorite. Not only because we are fiercely patriotic…but because it’s also my sweet Hubby’s Birthday yay!!!! So they hold a very special place in our hearts. 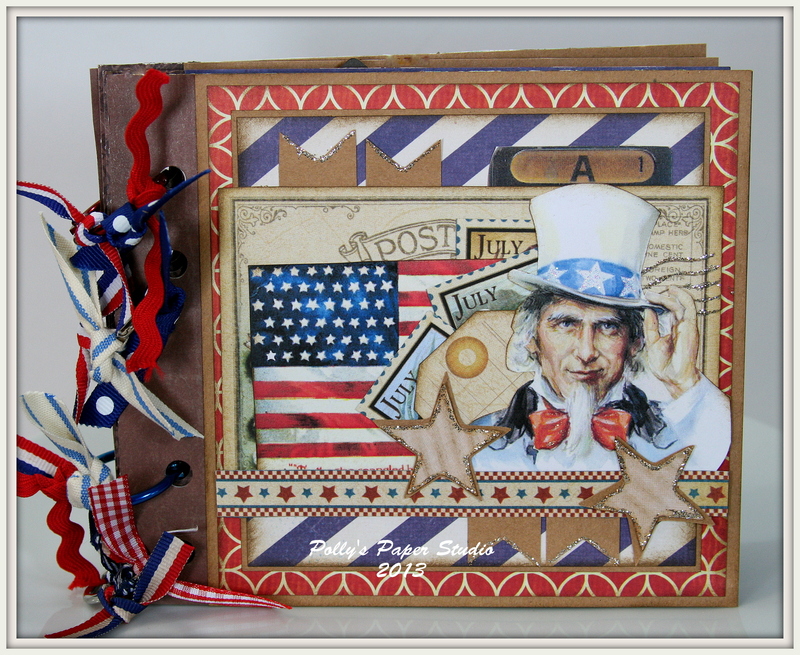 I do like to make a handcrafted gift for him with an Americana theme…..I’ve created banners and buckets and mini albums. This year it’s another mini….and I’ve put together a class so you all can make one too! They’re a great place to showcase your favorite holiday pictures and memories. They also become a wonderful part of your seasonal decor. 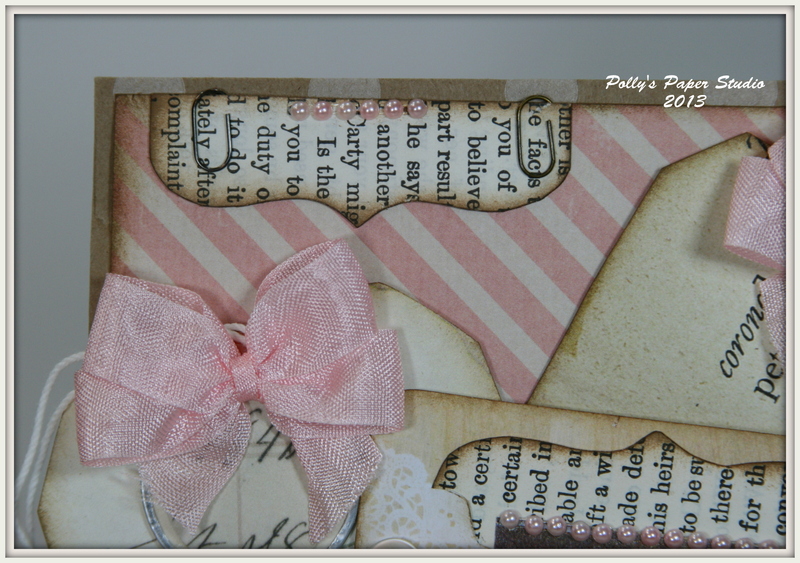 This album is loaded with vintage patriotic images, glitter accents….and lot’s of Really Reasonable Ribbon trims. Inside there’s many pocket’s and tags, and a fun fold out mini- in- a -mini. You can stop into the shop to see the rest of the album….and to sign up for the class. As always…..you can call and save your spot and leave your deposit by calling me during regular business hours. Please do not leave deposit info on a message. The class will be April 30th at 6pm. Cost for the class is $30 and includes all materials and adhesives. Kit’s for the class will be offered in the Etsy shop by the end of the week. Additional seating may be offered in May….depending upon availability of supplies. 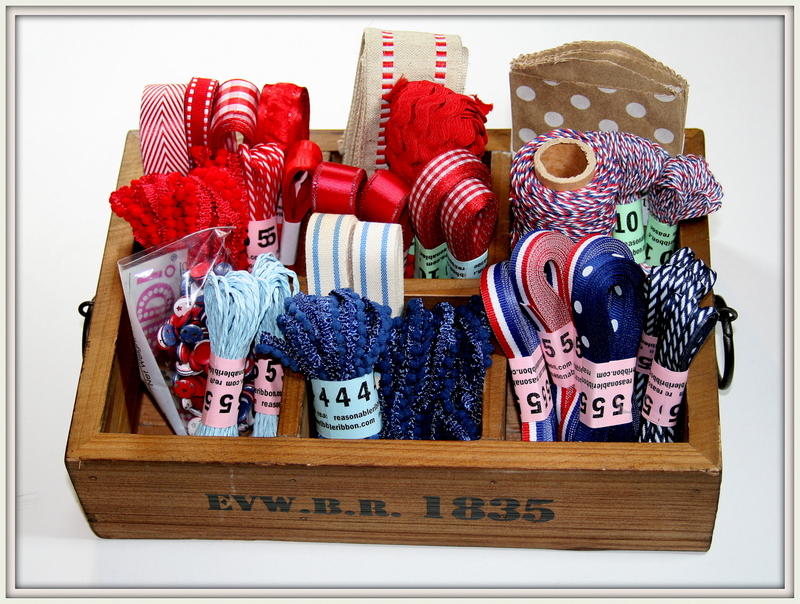 I’m doing the happy happy happy dance over the trims I ordered for our Vintage Patriotic Mini Album Class and kits. The 4th of July holds a very special place in our hearts….not only because we are fiercely patriotic….but it’s also my dear Husbands Birthday : ) There is soooo much selection of ribbons just right for the 4th of July…or any patriotic or Americana projects over at Really Reasonable Ribbon….you should go check it out and pick up some ( or lot’s ) for your own projects! This crate full of trims is getting me all kinds of excited! Are you saying to yourself…but Ginny…not all of those trims are vintagy? Not to worry my Peeps I’ve got a few tricks up my sleeve. As you can see…there’s grosgrain and twine, and pom poms, Middy Bags, ric rac, and candy dots! Woo Hoo. 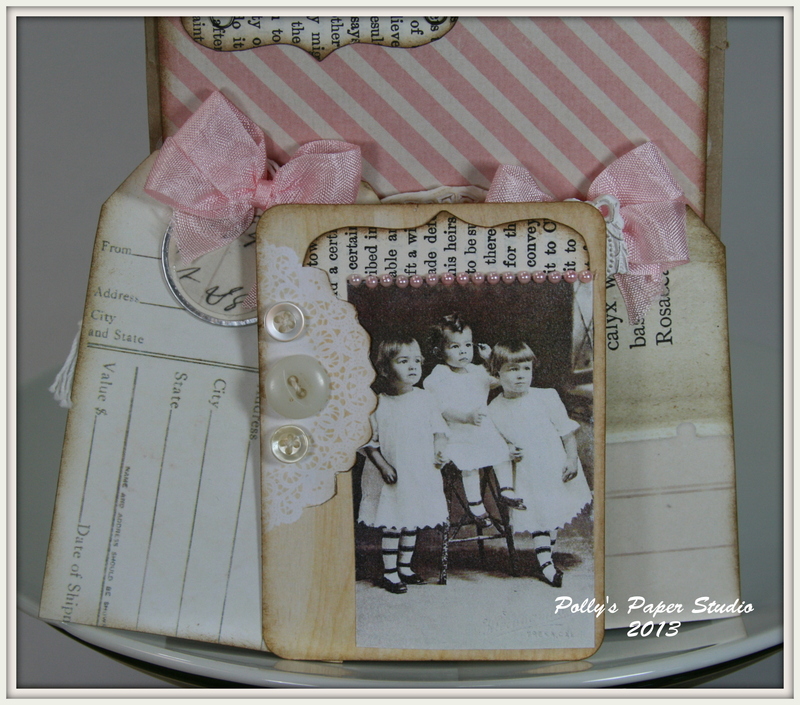 I’m about 90% done on the Vintage Patriotic mini album…and I really really love it….so I’ll be posting the class and kits very soon. Until then..here’s something for your viewing pleasure…..Bonnie is announcing the new Design Team over at Really Reasonable Ribbon’s Ramblings…..hop on over to check out the new girls…don’t forget to leave them a little love. I usually try to keep my posts upbeat and positive. I want Polly’s to be a refuge from all the craziness of the world. But there are times in your life when you must be creative for the sake of something sad. At my Husbands work they recently lost a member of their work family suddenly. Although I do not know the woman who passed…I can sympathize with how they all must be feeling. I felt compelled to create a card for them to give to the family. While I was working out the details…I decided upon a tag booklet instead….filled with tags so they could all write their own sentiment and add it to the inside pockets. 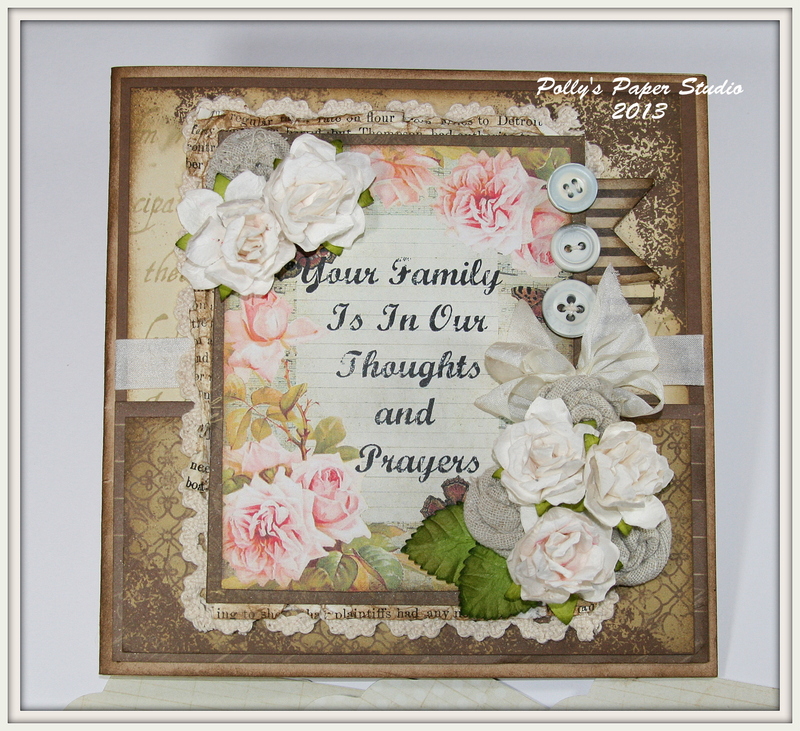 I started with lot’s of paper layers and topped it off with a vintage image that I added the sentiment to. 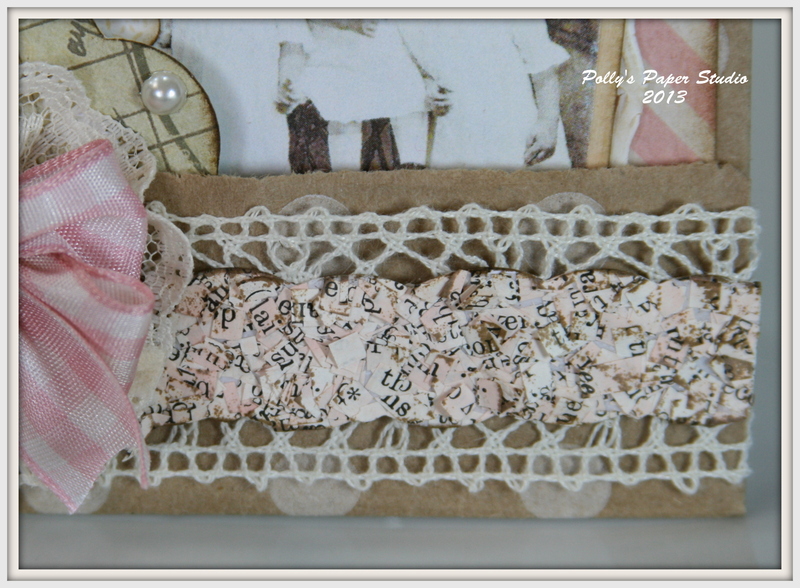 There’s a mix of paper roses and wrinkle ribbon bows. I layered in some hand rolled burlap flowers as well to anchor the lighter colors. Inside there’s pockets to hold the tags. I hope when the family receives this booklet it will give them a sense of how much the woman was cared for by her workplace family.